Kongsvinger Fortress (Norwegian: Kongsvinger festning) is located in the city and municipality of Kongsvinger in the county of Hedmark, Norway. It is situated on a hill west and north of the Glomma river, standing astride the ancient Vinger Royal Road, which connected Norway and Värmland, Sweden as well as on the north-south Norwegian route along the Glomma. As Kongsvinger formed a key junction point for these routes, fortifications were constructed there to protect against invasion from the east. Well and old barracks at Kongsvinger Fortress. During the early medieval period, pilgrims traveled to the shrine of St. Olaf at Trondheim; a favorite route for those from Sweden (the Vinger Royal Road) passed via Eidskog, Vinger (now Kongsvinger) and Elverum up the Glomma. This important pilgrimage & trade route is mentioned by Adam of Bremen in 1070. Its importance as an established road leading both north and south from the Swedish border was the basis for its later military significance. Between 1130 and 1217 Norway underwent a period of Civil Wars. The Bagler faction contested with the Birkebeiners, led by the pretender King Sverre, for control during the late 12th century. Many of the rebels found refuge in Värmland and the Vinger area was the site of numerous conflicts. Sigurd Ribbung harassed King Haakon IV of Norway’s lands across this border. In 1224 they fought a battle at Vinger. Ribbung’s troops were defeated and fled. Svante Nilsson (Sture), who married the Norwegian rebel Knut Alvsson's widow, advanced on Oslo from Värmland, Sweden, entering Norway via the roadway at Vinger, but failed to take Akershus Fortress in Oslo. From there he proceeded to and captured Tønsberg Fortress. King Hans (Danish monarch and union king of Denmark (1481 – 1513), Norway (1483 – 1513) Sweden (1497 – 1501)) signed a truce with the rebels in 1504. The invasion demonstrated the vulnerability of the route through Vinger. In the spring of 1643 the Swedish Privy Council determined that their military strength made territorial gains at the expense of Denmark/Norway likely. The Count drew up the plan for war and directed a surprise multiple-front attack on Denmark and Norway in May. Norway, which was then governed by Christian's son-in-law, Statholder (royal governor) Hannibal Sehested, was a reluctant participant. Some Finnish people in the Finnskogen, who had migrated from Sweden and whose loyalties were often with Sweden, were caught spying on Norwegian troops at Vinger. A rather desultory war between Sweden and Norway, often called the Hannibal War, resulted from 1643 to 1645. Vinger was the staging area for several minor Norwegian invasions into Sweden as this final episode of the Thirty Years' War was completed. The most important consequence of this war was that the royal governor identified the need for fortifications at Vinger and elsewhere along the border and initiated a tax for the purpose. Since there was great discontent, this tax burden was lifted in 1646 by Christian IV of Denmark and Norway; as a result no fortification construction was begun at that time. In 1673, Ulrik Frederik Gyldenløve wrote that construction was underway on a defensive structure on top of a hill. Once completed, it would dominate the river and the existing sconce by the ferry crossing. This structure was called Vinger Sconce or Gyldenborg and was a precursor to Kongsvinger Fortress. It was never attacked during the Scanian War, which broke out in 1675, but it did fire its cannons against a Swedish reconnaissance unit. An attack was launched from Vinger in February 1679, but it was unable to penetrate deep into Sweden due to insufficient artillery. Following the war, fortifications were improved along the border toward Sweden. Plans were made for a star-shaped fortress and construction began in 1682 on the site of the old Vinger Sconce. The new fortress was named Königs Winger, which has since become Kongsvinger, both meaning King's Vinger. Today, Øvrebyen, the old Kongsvinger uptown area around the fortress is dominated by wooden buildings from the 18th and 19th centuries, laid out in the typical right angle square plan - by architect Major General Johan Caspar von Cicignon - popular in this period. In 1709, during the Great Northern War, Norway was mobilized and by the end of October 1709, 1,500 men were stationed at Kongsvinger. When in 1716 it became apparent that the Charles XII of Sweden intended to invade, three fortresses along the Swedish border were again extensively manned: Kongsvinger Fortress, Basmo Fortress and Fredriksten Fortress. The attack fell on Basmo and Kongsvinger was bypassed. Although a significant part of the Norwegian border fortification during several wars with Sweden, Kongsvinger never saw attack. The closest offensive occurred in 1808 during the Napoleonic Wars, when a Swedish column advanced against the fortress of Kongsvinger. They reached the Glomma River after a victory at Lier on 18 April, but did not cross the river and invest the fortress. On 10 March 1809 an interim armistice was signed at Kongsvinger. Later, in 1814, the most bloody battle between Swedish invaders and defending Norwegian forces during the Napoleonic Wars took place at Matrand, a short distance from Kongsvinger on the Eidskog road. The Swedish lost 337 men, compared with 139 killed and wounded on the Norwegian side. Aasmund Olavsson Vinje (1818–1870) was a famous Norwegian poet and journalist who wrote in his Ferdaminni fraa Sumaren 1860, "One of the finest views in the country is to stand at Kongsvinger Fortress and gaze down the Glomma." 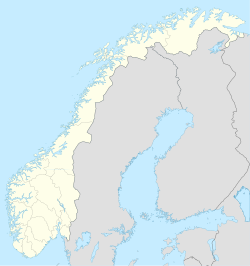 In 1905, when the union between Sweden and Norway was dissolved, a neutral zone was established in which all fortifications were to be demolished. Kongsvinger lay just outside this zone and the fortification survived. Nazi Germany invaded Norway on 9 April 1940. Although not invested, Norwegian fortresses fell under German control. In August 1942 a school providing four-week course in national socialist ideology opened for the Germanske SS Norge at Kongsvinger Fortress. Several classes graduated there. Frost, Robert I. (2000). The Northern Wars; 1558-1721. Longman, Harlow, England. ISBN 0-582-06429-5. Kavli, Guthorm (1987). Norges festninger. Universitetsforlaget. ISBN 82-00-18430-7. Larson, Karen (1948). A History of Norway. Princeton University Press. ISBN none. Lisk, Jill (1967). The Struggle for Supremacy in the Baltic: 1600-1725. Funk & Wagnalls, New York. none. Mathisen, Trygve (1952). Fra Bondeoppbud til Legdshær. Guldendal Norsk Forlag. none. Rastad, Per Erik (1992). Kongsvinger festnings historie. Vakten ved Vinger – Kongsvinger festning 1682–1807. Kongsvinger. ISBN none. Stagg, Frank Noel (1956). East Norway and its Frontier. George Allen & Unwin, Ltd. ISBN none. ^ Rastad, Per Erik (1982). Kongsvinger festnings historie. Krigsårene 1807–1814. Kongsvinger. ISBN none. This page was last edited on 5 February 2018, at 01:58 (UTC).